With freshwater declining throughout the globe, desalination looks increasingly attractive, but current technologies are expensive, demand far too much energy and are prone to contamination. Now researchers from the University of Texas at Austin and the University of Marburg in Germany have developed a “water chip” that creates a small electrical field that separates salt from seawater. The technology, which is still under development and works at the nano scale, uses so little energy it can run off a store-bought battery! The researchers apply a 3.0 volt electrical charge to the plastic water chip, which has a microchannel with two branches. By creating an “ion depletion zone” with an embedded electrode that neutralizes chloride ions, they are able to redirect the salts in the water down one channel, while the fresh water goes down another. “Like a troll at the foot of the bridge, the ion depletion zone prevents salt from passing through, resulting in the production of freshwater,” the team wrote in a recent press release. Less energy-intensive than current desalination plants, the water chip doesn’t rely on a membrane, and can be made portable so that just about anybody living near the sea can purify their own water at home. Currently the technology purifies just one nanoliter at a time and only has a 25% efficiency rate, but the team is confident that their proof of concept can be first improved and then scaled up. A small startup called Okeanos Technologies has been created to continue developing the technology. Its head, Tony Frudakis, said in the statement that people are dying for want of freshwater, and they will persevere to prevent that from happening. “You could build a disaster relief array or a municipal-scale unit,” said Frudakis. Very large scale factor to overcome. A nanoliter is one billionth of a liter. Hopefully the power does not have to scale as welll. Well, the water will exit peoples' bodies at some point. Perhaps it could be delivered to the water treatment facilities. What happens to all the salt that is pulled from the ocean once everyone is doing this? With freshwater declining throughout the globe, desalination looks increasingly attractive, but current technologies are expensive, demand far too much energy and are prone to contamination. 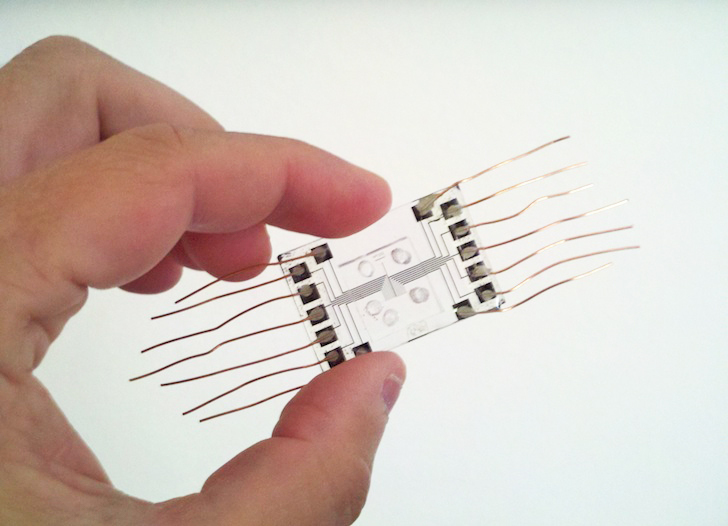 Now researchers from the University of Texas at Austin and the University of Marburg in Germany have developed a "water chip" that creates a small electrical field that separates salt from seawater. The technology, which is still under development and works at the nano scale, uses so little energy it can run off a store-bought battery!